With flexible fingers play the mouse to unlock features performance of computer program. Every now and then he pressed the keyboard to write letters and numbers . Although there are pros and cons about computer use by toddlers, but we can see the positive values of this computer things, beside it can accelerate toddlers to familiarize letters, also he used to take advantage of advanced technology in early age. Then we'll want to identify the needs of children and toddlers and try to select the programs that benefit them. Also we need keep in mind, toddlers should be pleased with its activities. So no need to focus on Our desire for them to master the programs we offered . Play and Learn. While playing the computer, toddler easier ferreting simple math program with images and color. This way is necessary to make a toddler like math and calculation things. 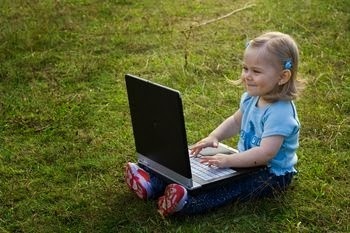 Toddlers can learn to read through a variety of computer programs that many in the market now. Guided worth using this technology in order to develop a wide range of skills. But behind the positive values earlier, It remain aware of the downside of this kind of technology. Toddlers can be addicted to playing games to forget time, forget eating, or other physical activity and become lazy. This is definitely not healthy. Make it appropriate for toddlers. He was interested in simple math, for example the introduction of shapes, numbers and letters. Interactive and encourage children that they can play together with their friends. Allows toddler drawing and coloring. We can print the picture and making it a book. They would be proud of his work . When Toddler Start to Experience Computer Is original article written, if you find that When Toddler Start to Experience Computer is violating DMCA please don't hesistate to contact me http://edutoddler.blogspot.com/2013/12/toddler-and-computer-interaction.html, and Thank For Visit Early Learning Methods for Child and Toddler. Thanks for visiting us again..